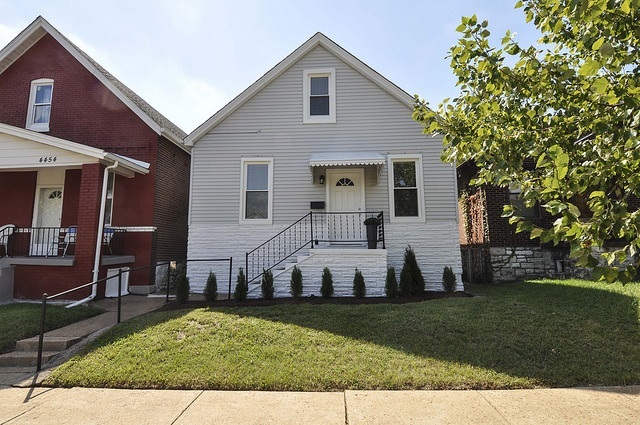 Circa 1911: Amazing Bevo home w/ tons of updates! This house has so many ways to live in it. We are showcasing it as main floor master, family room, living/dining room & huge kitchen. There are two bedrooms upstairs as well. Let’s talk about the high dollar/piece of mind updates in 2018 – HVAC (furnace, ac & thermostat); roof, vinyl windows, newly insulated w/ R38 blown insulation. Think about the energy savings you will be earning every month. Wait until you see the kitchen – lots of counter space, ton of new cabinets, new disposal, undermount lights, new flooring & brand new appliances that stay. The bathroom is amazing as well – first, its huge; second, double bowl vanity are brand new as well as the faucets. Still more updates – new light fixtures throughout; new cellar & basement doors; new carpeting in 1st floor bedroom, stairs & 2nd floor rooms. Did I mention a new hot water heater & exterior electrical service? Professionally painted to top it all off. Off street parking too.